Today, Sara’s Tearooms reopens for the first time in 2012…we will be serving our usual quality Homemade Meals and Cakes from 10:30am until 4:30pm. Come along and enjoy the March weather this weekend with a walk along the seafront and then some delicious food and homemade cakes in our Flower Garden or on the Beach Terrace at Sara’s Tearooms. 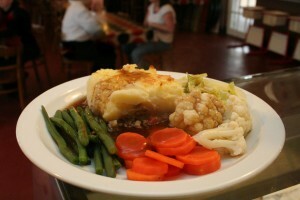 Beef mince and vegetables in a rich gravy covered with creamy mashed potatoes and topped with cheese. Don’t forget to come and show your support for Great Yarmouth’s unsung heroes running the Great Yarmouth Sport Relief Golden Mile tomorrow (Sunday 25th March)…the Start Finish line is right on our doorstep, so you can relax and watch the action with a nice coffee and a homemade cake. At Sara’s Tearooms we are proud to serve up genuine homemade food made with the freshest ingredients to ensure that we serve a good quality wholesome meal. Our homemade specials are changed on a daily basis and are always subject to availability as we regularly sell out. Looking for somewhere to park for free near to Sara’s Tearooms…use our FREE PARKING MAP guide to help you find a space.